If your practices only consist of drills, structured walkthroughs of your team’s plays, and instructional lectures, you will quickly lose your young players’ attention and enthusiasm. An effective practice that fully engages your players must also include some fun competitive activities. Let's take a look at some of the ways you can both liven up your practices and still teach important lessons. Your players’ favorite competitive activity is scrimmaging—playing the game and competing against other players. Pick two teams, throw a ball out, and your players would have fun playing each other for the entire practice. Of course, we want more from our season, and scrimmaging is only one component of a well planned practice. But it’s an important one. Scrimmages afford your kids an opportunity not only to have fun, but also put to the test newly learned individual and team skills. As a coach, scrimmages provide you with the opportunity to implement your offensive and defensive systems and practice team play. But more important to each player's individual development, scrimmages provide you with a unique opportunity to "coach your kids up." Young players often miss the game moments when opportunity presents itself. When a player doesn't make the open pass, fails to recognize an opportunity to gain advantage, positions themselves incorrectly, or otherwise makes a mental mistake, you can stop play and instruct your player on the correct action. Without stopping the action you can also bark out instructions, comments, and compliments. If you're physically able to practice with your kids, you can also actively demonstrate correct behavior. For example, you can aggressively call out commands ("Pick Left!, Help!, Switch!") to show kids how to communicate with each other on defense. You can also instruct the player you're matched up against. In all of these cases, you help the young player better connect opportunity with action. This is especially useful to those players who don't regularly play pickup games. Although they may have mastered essential sports skills, they are unfamiliar with patterns of play. They often haven't developed an innate sense of how and when to use their skills in a fast-paced, competitive game. Always include scrimmage time in each practice. You also need to identify other competitive activities and drills that your players enjoy. If you are new to coaching, most coaching books include help in this area. Also, watch your kids before and after your practice and note any games they are playing as a group. You may want to add this game to the end of your practice. 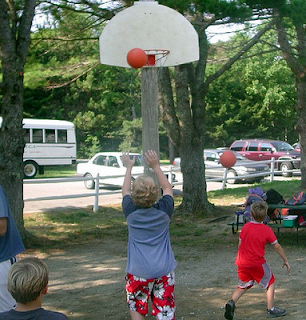 In my basketball practices, the free-throw shooting game “Knockout” is popular at all age levels. In this game, players line up behind each other and one-by-one shoot a free throw, rebound any misses, and then convert a layup. If the player behind them makes their shot before they do, they are “knocked out” of the game. This fun game emphasizes shooting both free throws and layups under pressure. As an alternative, I occasionally select two teams and have them shoot free throws at different baskets. First one to ten wins. In a close contest, the excitement always builds toward the end of the game. Even conditioning exercises such as sprints are more fun when you add a competitive element. Look for similar games and fun contests in your sport. For example, in baseball, kids enjoy base running drills that involve racing. You can finish your practices with a relay race between two groups of players, each starting at opposite bases (e.g., home and second). Give the first player in each group a ball and have them pass it to the next player in line after they have completed a lap around the bases. Similar to the free throw contest in basketball, your kids will get excited as the race nears the finish line. Add some spice to your practices to keep your players interested and the energy level high. Do you have any favorite fun drills or other activities that you use in your sport's practices?